It’s no surprise the most popular exercise in the United States is walking. The low-impact, gentle nature of the exercise has proven to be beneficial even if it doesn’t always feel like you’re working hard. Maintaining a relatively active lifestyle is important for performing daily tasks with ease, and can even help prevent falls later in life. However, if you’re looking to get more out of your workout without adding too much strain on your body, interval walking may be perfect for you! How does interval training work? Simple! Instead of walking at a steady pace throughout the duration of your exercise, try alternating spurts of a faster pace with less intense ones. This constant variation will get your heart rate up, then allow it to slow back down a little, which may increase your metabolism and improve your respiratory health. When you’re ready to give it a try, make sure you warm up your muscles with a 5-10 minute stretch or a light walk. After warming up, try picking up the pace for about 60-seconds to a brisk walk or even a light jog. Next, slow your pace back to a comfortable walk for two minutes. That’s one cycle! Repeat that cycle four to five times or until you’re fatigued. Celebrate your new success with a refreshing post-workout smoothie, like this one. As always, be sure to speak with your physician before adopting any new exercise routine. The best part of interval training is that you can keep switching it up to stay engaged. Performing the same workout routine over and over again can get boring and your body may get used to the exercise and need a new challenge. Try varying the intensity of your intervals or change up the timing so that you work harder for two minutes and rest for 60-seconds instead. Remember that any type of physical activity is better than none. 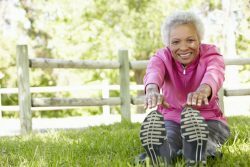 The American Heart Association recommends that older adults aim for at least 150 minutes (2.5 hours) of moderate-intensity physical activity per week. Talk with your physician and take it slow. There are plenty of options to maintain an active lifestyle, so turn up your favorite playlist and go!